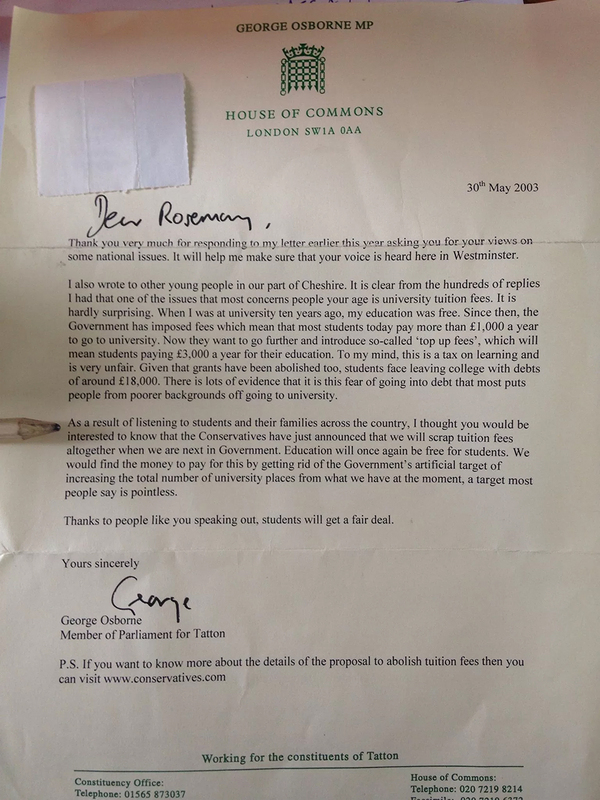 Former student finds letter from George Osborne calling tuition fees "very unfair"
A student has just found a letter from George Osborne, penned 13 years ago, in which he called £3,000 tuition fees "very unfair" tax on learning and education. The letter from 2003, when the Tories weren't in power, laments how £3,000 a year tuition fees could put off students from poorer backgrounds from attending university. "‘There is lots of evidence that is this fear of going into debt that most puts people from poorer backgrounds off going to university," he wrote in the letter. Once in power, Osborne and company raised the fees to £9,000 and regularly say that there's no evidence higher fees put off poorer students from going to university. The full letter, signed by George Osborne. For more details of the proposal to abolish tuition fees visit www.conservatives.com and then go back in time. "Routed through a box of old letters last night and discovered this brief exchange (16 years ago) with a young, up and coming MP by the name of George Osborne. He talks about the *shocking* £1000 a year students pay, the "tax on learning", and promised free university education if the Conservatives were to get in... So glad he made sure our "voices were heard in parliament" 😐 "
Time will tell whether Gideon will have another change of heart the moment he leaves office. Like this? Course you do! Now how about some freebies?